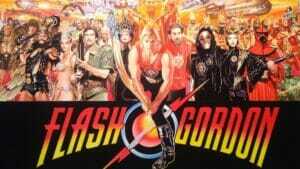 Flash Gordon charges in to rescue us from bad movies! Okay, perhaps that intro is over the top, but in a time where many films today are dark and depressing, both in cinematography and tonally, to have a return of the corny Dino De Laurentiis produced film oddly enough came off as somewhat refreshing. The story is a simple one. In fact this theme has been around since Edgar Rice Burroughs debuted his famous Earth-born/hero of Mars John Carter back in 1912, dealing with an Earthman thrust into extraordinary circumstances beyond his understanding. This is an idea that would be revisited time and again, including the introduction of Buck Rogers in 1929 and Flash Gordon in 1934. These two would find an enduring popularity that would see them be revisited in books, TV, and for Flash, the big screen in 1980. It was here that Flash Gordon was treated with all of the wonderful cinematography excesses that typified 80’s cinema. The movie opens with a viewing screen staring out into space, and then a disembodied voice comes on asking for something to “play with.” Another disembodied voice, equally menacing and filled with venom, shows the first voice an image of Earth. Promptly the first voice activates something that starts all sorts of disasters on Earth. That takes us to….. FLASH! *BOOM* AHHHHH!!!!!!!!! The title song by one of the 70’s and 80’s most popular rock acts, Queen!!! The story then tells the tale of how football star, Flash Gordon (Sam Jones), is introduced to a reporter named Dale Arden (Melody Anderson) while on a small commuter plane. Because of an attack by some force from outer space, Flash and Dale are forced to make an emergency crash landing of the plane that takes them right to Dr. Hans Zarkov (Topol), an ex-NASA scientist who has been discredited for claiming that an attack from aliens was eminent. He tricks Flash and Dale to go inside his space capsule, and then it’s launched towards the source of the outer space attack. They find themselves on Mongo where they are taken prisoner and escorted to the presence of Emperor Ming the Merciless (Max von Sydow). Ming is promptly smitten with Dale, but Flash, not standing for anyone taking Dale away from him, tries to fight his way out, but sadly fails and is sentenced to be executed. Ming’s daughter, the Princess Aura (Ornella Muti) secretly saves Flash and spirits him away to the moon Arbor, home of Prince Barin (Timothy Dalton), who has no desire to keep Flash alive because of the jealousy he feels towards anyone who catches Aura’s eye. Meanwhile Zarkov has been brainwashed into being a secret agent for Ming, and Dale has been named to be one of Ming’s concubines. Dale escapes, bumps into Zarkov, and after they both leave the palace we learn that Zarkov was never brainwashed to begin with. Unfortunately Prince Vultan’s Hawkmen then captures them at the very same time that other Hawkmen take custody of both Flash and Barin, leading to a reunion of sorts at the palace of Vultan (Brian Blessed) himself. It is here that Barin learns of the good heart Flash has, Vultan has a change of heart himself and allies his Hawkpeople with Barin and Flash, while Ming has taken Dale away again, only this time to become his wife. This movie is all over the place. Being the big fan I am of the band Queen, that was my sole reason for wanting to see this film back in 1980, not for any sci-fi aspect of it. It was never a huge box office hit, but it did garner a strong cult following, and after having seen a release on home video, the film has from time to time found its way back on to the big screen for the occasional special showing, both recently at the Phoenix Film Festival, and again at the Alamo Drafthouse Theater (where we saw it). To see it on the big screen was a treat. For starters, the quality of the images looked amazing. Filmmakers today love to take the color saturation out their films, or alter the color palate in some fashion. Flash Gordon is rich with color and detail, which at times does serve as a detriment when it comes to some of the visual effects. However, watching that today does give that sense of nostalgia as it hearkens back to the old serial starring Buster Crabbe, along with the cheap model work of that day. The acting in this film is also pretty poor in some places, and completely over the top campy in others. Sam Jones is pretty stiff as the two-dimensional football hero, and Melody Anderson’s Dale Arden borders on the comedic as she tries to straddle the line of being both damsel in distress and a strong female character. However, the real joy lies in some of the supporting roles. Topol finds the proper comedic tone that is written into his character, making Zarkov clownish, eccentric, and a genius, all at the same time. Brian Blessed is… well… BOISTEROUS!!! He has lines that are so shouted from the mountaintop as to have become memes in their own right. Even on Twitter Brian mocks his own delivery, clearly understanding how Vultan, as well as the rest of these characters, are not to be taken seriously. Then there is Max von Sydow as Ming. He was born to play Ming! Here is an actor with some of the most serious chops in the business, haven taken on some wonderfully dramatic roles, and yet shows he can play two-dimensional camp with the character of Ming, and be worthy of the role as originally played in 1936 by Charles Middleton. It is hard to find a villain to love, and Max von Sydow achieves that here with great splendor. I would be remiss if I did not make some commentary on the music by Queen. This was their first foray into cinematic music. In its own way the music is just as campy as the film, especially with its title track. There is a moment much later on in the film where an unusual melody line is being sung by Freddie Mercury, starting with a very high falsetto and stepping its way down to a more “chest voice.” I’m sure that Freddie and the boys meant well when they recorded that piece for the film, but by today’s standards it sounds more like two cats yowling at each other prior to a fight. Even some of the attack music, one part written by Freddie, and another, more guitar driven, piece by Brian May, sounds ridiculous. The music itself sounds great, but as a part of a soundtrack it tends to feel out of place, and this is coming from someone who is a huge fan of the band. This movie is something of a joke. Perhaps it wasn’t originally intended to be when it was first conceived, produced, and then released. I don’t remember much laughter when I first saw it in the theater, but there were plenty of laughs at the most recent theatrical showing of this “classic.” Perhaps the filmmakers had no idea what they were doing. Then again, perhaps they understood better than most that this was more of a slightly comedic tip of the hat to the classic hero, that the only way to properly immortalize Flash Gordon would be to give him a film with set designs and costumes that had greater excess than the entire ABC series Dynasty, accompanied by a soundtrack from a band whose career was built around excessive production values. 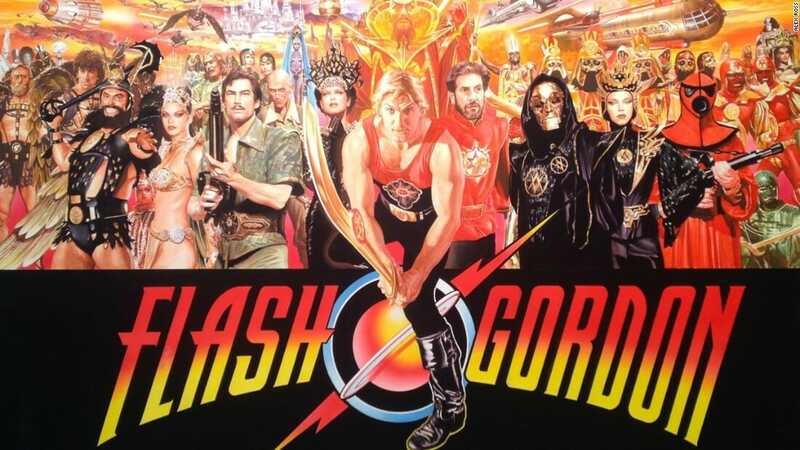 If you were to ask me why the Flash Gordon movie works so well in one word, that word would be “sincerity.” This movie knows what is is, and it doesn’t apologize for it, nor does it do any sort of wink-and-nod to the camera, it leans in. Not many movies, even good ones, do that.